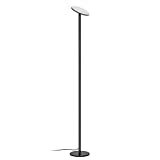 √ ELINKUME LED Dimmable Floor Lamp, iron material lamp body and lamp base, black appearance, size: (L)16cm*(W)16cm*(H)158cm. √ USB Plug, easy to use. energy saving 2835 SMD LED light source give you enough and soft lighting. No glare or flickering, giving continious protection to your eyes. 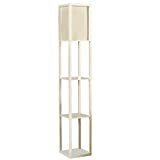 √ Space-saving, triangle stand, modern and lite but very sturdy and solid. 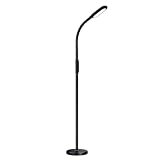 flexible curved'gooseneck tube' can adjust lighting angle to focus light in almost any direction. 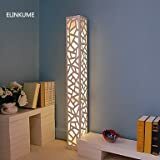 √ What you get, 1PCS USB plug dimmable led floor lamp, 12 months warranty from ELINKUME, If you have any question, pls feel free to contact us. Unique TIMING function:(1)Regular timing : can set the required numbers of hour to turn off the light, very convenient to use, especially fit for sleeper who forget to switch off the light. For detail of operation, please see below product information. 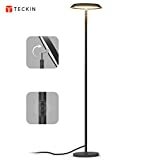 (2)Circular timing : can set the required numbers of hour and required period of time to turn on and off the light daily and accurately, especially fit for outdoor lighting. For detail of operation, please see below product information. RGBW LED FLOODLIGHT:The LED of the floodlight is composed of 10W white chips and 10W RGB chips. The white and RBG light are supported by independent chipset respectively. No mixed color in the white light. The white light is pure warm white and is equal to 60W incandescent. 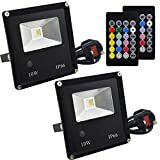 Colour Changing LED Floodlight: RGB mode + MEMORY, It includes 14 colors of light and 4 modes of flashing effect [FLASH, STROBE, FADE, SMOOTH]. For STROBE mode, it has 5 different time intervals - 3 seconds, 2 seconds, 1 second, 0.5 seconds, 0.13 seconds. Also it equips with memory function for which it can remember the color or mode last time used. 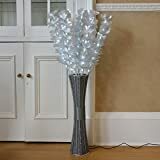 PERFECT FOR garden lights, lawn lights, tree lights, wall lights, party lights, security lights etc. Convenient, Safer and Waterproof: It contains wire [4.9ft] and UK 3-plug.It is more safer in use with ground wire connected.It is composed of aluminum shell, tempered glass and high-grade waterproof ring which help to achieve waterproof IP66 level. This is suitable for long hour outdoor work ( DO NOT submerge it into the water). 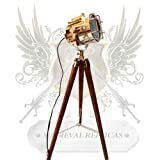 Factory DirectlyI Supply: More than 10 years experience in researching and development of led floodlights, 18-month warranty and 30 days money back for Amazon customers. If you have any problem, Please do not Hesitate to contact us. 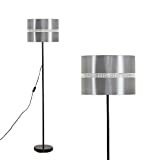 The perfect soft lighting solution for any room in your home! 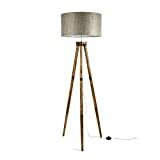 Overall Size: 65L x 65W x 99-143H cm. Assembly Required. Structure: The shade is collapsible and replaceable. 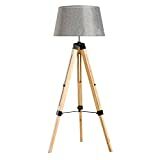 The lamp is easy to be assembled, and the complete done is stable without shake. Clean: It's easy to be cleaned with a dust cloth. 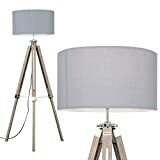 Color: The lampshade itself is white. When lighted up with bulbs in 2700K, the lamp is warm white. 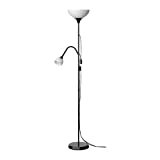 Classic and elegant design makes it easy to place in any room of the house. 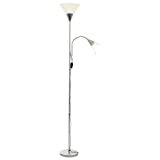 Contemporary black chrome metal floor lamp uplighter with heavily weighted base. Features dome shaped frosted polycarbonate diffuser shade. Complete with inline on/off switch button. 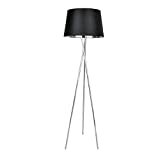 Dimensions - Height: 179cm, Shade Diameter: 28cm. 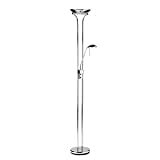 Durable & Adjustable Gooseneck AVAWAY Floor Lamp enable easily adjust the tilt to fit the height you want. 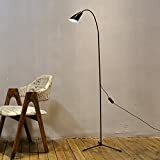 You can also flexible to swivel the lamp head toward the direction wherever you want. 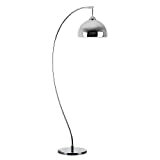 Slim design make it not only a lamp, but also a space saving decoration. 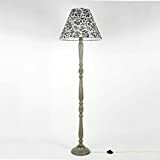 Energy Efficiency & Eye-caring With 60 LED bulbs eco friendly lamp is 80% less energy than incandescent lamps for the same brightness.It can also delivers 50,000 hours of high-lifespan. 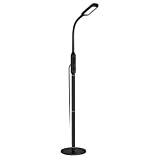 Reflective LED lighting source provides Natural, non-flickering light for stress-free productivity and enjoyment. 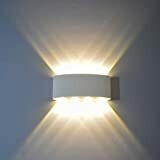 Dimmable & Memory Function 5 Dimmer Brightness Levels and 5 Color Temperature Modes(3000K-6000K), which is great to dim the light to find the perfect brightness level for your situation. Also, the lamp will automatically resume the brightness setting of the previous use when restarted. 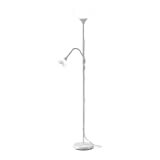 Stable & Wide Range of Use 3kg weighted keeps the lamp stand more stable, preventing children and pets from easily knocking it down. No restricted using range, perfect for reading in sofa, working on bench, studying on desk, relaxing in bed, and playing piano. 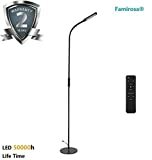 What You Get Avaway 10W Adjustable LED Floor Lamp, Power Adapter, Welcome Guide, Remote Control Switch, Friendly Consult Service Guarantee. Can be switched on and off separately. 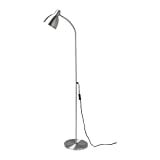 Uplighter and reading arm are operated by separate built-in dimmer switches. Layer 4 unique vertical storage rack space: indoor lighting and decorative storage overall to be an interior cozy corner. Wood materials, intermediate separator can withstand the weight of 20 kg. Parchment shade, easy to clean, light evenly. Wooden single assembly, disassembly simple, durable. Chinese flavor, in any place is the scenery. Please rest assured purchase commitment for 12 months of free maintenance. Light and atmosphere: Very comfortable! 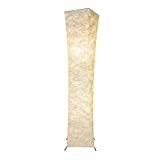 Brightness moderate, the fabric lampshadegives a soft glowing light. Warm and sweet, Romantic, Gently and soft, Quiet,Cheerful ... in different color and different brightness. Design and structure: Contemporary, Simple style. The shade is collapsible andreplaceable. 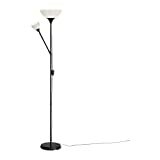 The lamp requires assembly but is easy to be assembled; thecompleted one is stable without shake. 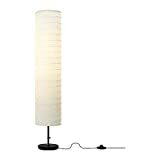 Lamp shade: Thelampshade material is Tyvek made by DuPont. It is light and tough, waterproof, non-discoloring,non-aging, no deformation and has excellent light effects. The lampshade itselfis white. 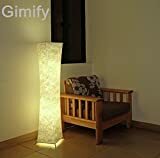 When lighted up with smart bulbs (included) in warm white (WW), thelamp is warm white. When adjust the color temperature from warm white (WW) tocool white (CW), the lamp will become cool white. 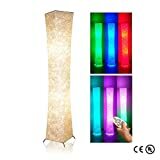 When lighted up with RGB color,the lamp is multiple colors. 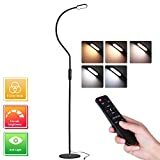 Multi-color light: Turn on bulbs by remote controller, you can chooseany color from RGB colors of the smart bulbs, red, green, blue, warm white orany color mixed out by them. It's also dimmable, you can set the comfortablebrightness in need. When the bulb is set in one of dynamic color modes, thelight will change from one color to another color constantly, at the meantime,you can adjust the change speed and the light brightness. You will find very fantasticand funny at your party . Remote control: More Convenience for you! 2.4G wireless panel remote controller with sensitive keys,long-range control, easy to operate. The remote can control the 2 RGB LED smartbulbs in the lamp synchronously or separately that brings you more funny and more convenience.